Reigning NBA Most Valuable Player James Harden understands what Batman, Superman, Spider-Man, and Darkwing Duck have already proved ... that if you're gonna be a hero, you gotta have some theme music. 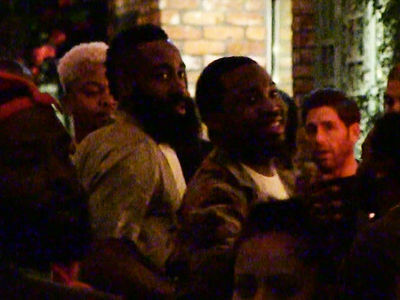 We got Harden cruising the streets of Hollywood yesterday (in a car fit for a superhero) and asked him what his theme music is when he pulls up to L.A. clubs to stunt. In true superhero fashion, Harden says very little (okay, maybe Deadpool is different), but rolls down his window for our guy and blares his answer as he pulls off into the Los Angeles sunset. In case you were wondering, the song is "Petrafyde" by NinaN9ne and 8ig Hungry ... which is a jam fit for a hero to be sure. BTW -- we didn't make up the rules for heroes and their theme music ... Keenen Ivory Wayans did. 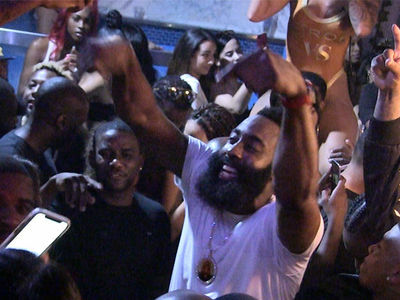 James Harden's Dayclub Dance Party, Is That a Coffin? !